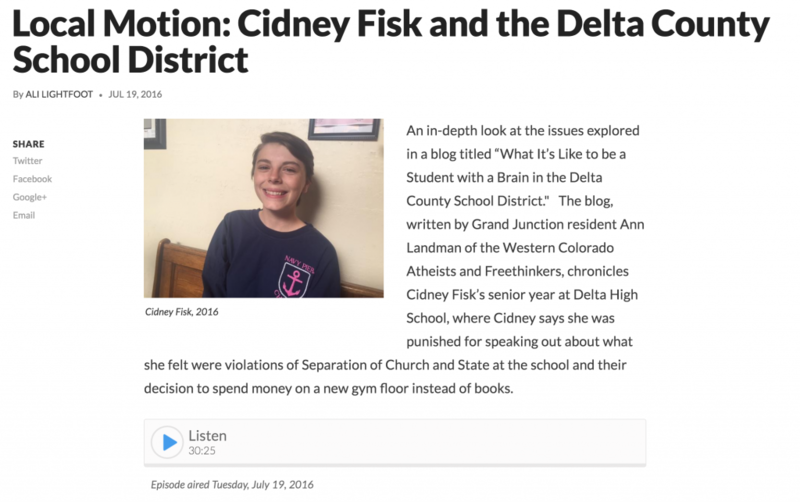 This 30 minute interview on KVNF Radio with Cidney Fisk and her parents about their experience with the Delta County School District was broadcast July 19, 2016. Host Ali Lightfoot interviews Cidney, her parents and Delta County School District officials about the religious speakers the school routinely brings in, other incidents of proselytizing occurring within the district, and the retribution Cidney faced from her teachers and counselors after voicing her opinions about that and what Cidney perceived as the district’s misguided financial priorities: Click this link to listen to the interview. ← More Government Endorsement of Religion in G.J. ?